This lesson plan will teach your student the children's song 'Row, Row, Row Your Boat'. The song uses a very simple melody and partial chords to get your student used to using more than one finger at a time. Triplet notes are also introduced. This song works well as a round so after the student learns it you could demonstrate how a round works. This resource uses an inbuilt incentive to encourage the student to practice. At the bottom of the page is a drawing. The incentive is that once the student learns the song they can then color in the drawing however they like. 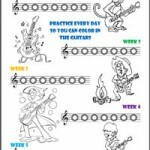 Setting up this reward before teaching the song is a great way to increase the student's focus during the lesson and it will also encourage the student to practice after the lesson.